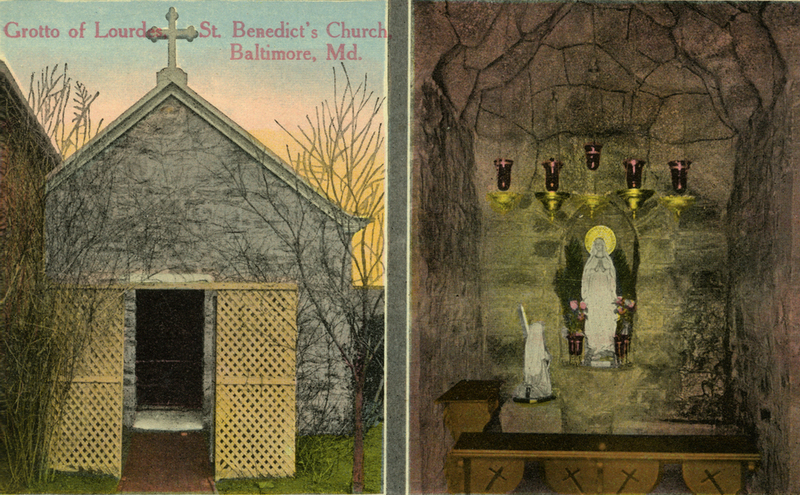 The flow of immigration, primarily from Germany and Ireland, had swelled the Catholic ranks within the See of Baltimore in the 1890s. In 1893, James Cardinal Gibbons, Archbishop of Baltimore, urged the Benedictine Society of Baltimore City to organize the unfranchised Catholics into a new congregation. The Society held a special meeting in March 1893 to introduce plans for the formation of Saint Benedict Parish and construction of a church. 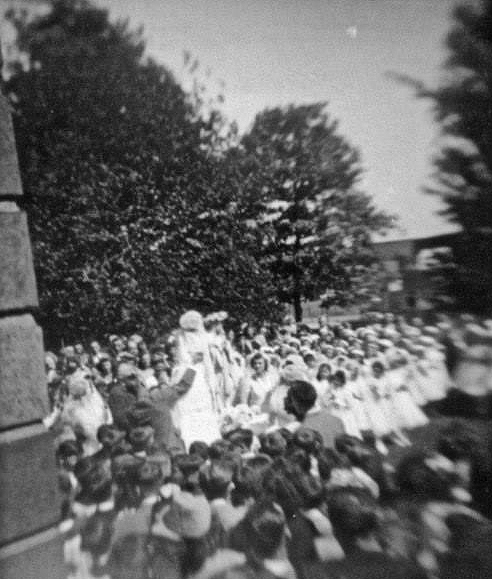 With this action on March 15, 1893, the parish planted in Mill Hill came to be. Although begotten of the German parish of Fourteen Holy Martyrs, the new parish had a territorial, not ethnic, orientation. For much of the next 70 years, Fourteen Holy Martyrs would be parent, paraclete and financial backer for Saint Benedict. The parishioners of the newly established parish set to work at once to build their first house of worship, which spanned the course of seven months. For the time being the Steinwedel Mansion served as the Sanctuary for the new parish and the location of the Parish Rectory. On October 19, 1893, the first Mass was celebrated and the church building consecrated on Thanksgiving Day 1893 by James Cardinal Gibbons. That same year Gibbons urged the parish to begin plans to build a school for the parish, mandated for all parishes by the Ninth Synod of Baltimore. The first formal day of education began on September 14, 1908, the Feast of the Exaltation of the Holy Cross. With two School Sisters of Notre Dame present and 70 children in attendance, the education of Catholic children began. 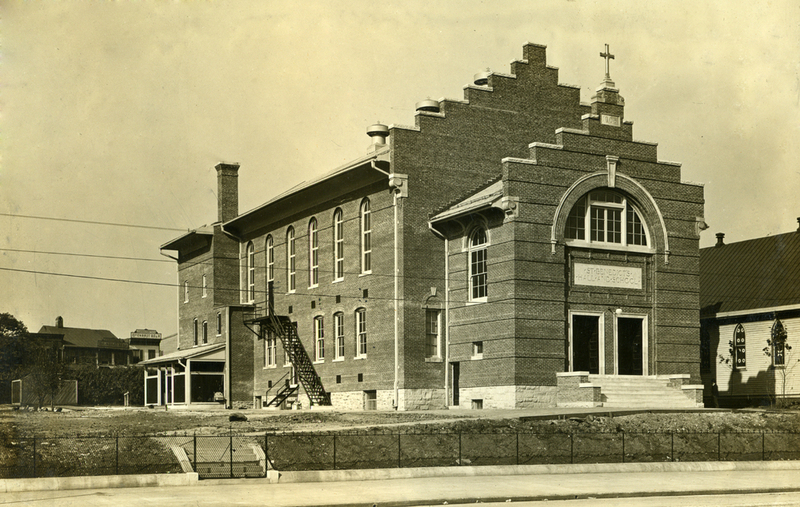 In 1913 the then-current church building needed expansion and the 19-year-old building witnessed one of its many capital improvements. The following year, the outbreak of World War I put an end to the German-American era in Baltimore. More than 55,000 young men from Baltimore served in the military with Allied troops on the battlefields of Europe. In July of 1922, talks began about building a new church, as the current structure was becoming inadequate to care for the spiritual needs of the flourishing parish. At the annual meeting of the Benedictine Society of Baltimore City in November of 1930, discussions were held about building a new church, “in the near future.” Fr. Aloysius Luther, O.S.B., the pastor, would lead this parish for many years and was well chosen to supervise this project. Construction work began in April of 1931, on the Monday after Easter Sunday. Benedictine monk and noted architect Fr. Michael McInerney, O.S.B., of Belmont Abbey in North Carolina, was called upon to design the new house of worship on Wilkens Avenue. On July 10 the cornerstone was laid in place, and for the next 11 months the parishioners were without a church building for the first time since 1893. On February 22, 1933, the solemn dedication of the new church was conducted with parishioners and dignitaries in abundance and solemnized by Archbishop Michael J. Curley. The decade of the 1940s witnessed the greatest percentages of increase in membership. In the 1940s, the stained glass windows were installed, completing the design of Fr. Michael McInerney, O.S.B. From 1943 to 1945 the amber glass windows were replaced with the stained glass windows designed and executed by Angelo Leopardo Pitassi, who worked out of his Pittsburgh studio. Fr. Aloysius provided the descriptions of the windows that included figural windows for the nave that illuminated the life and miracles of the patron of the Parish, Saint Benedict. Additionally, windows from the hand of Pitassi filled the sanctuary, the Mairian Chapel, the Baptistery, and the Great Wheel Window of the Apostles.The interior of the church was now illuminated with painted light. The 1950s saw the erection of its current school building, built to accommodate the increasing number of children. One of Fr. Aloysius’ last reports to the Benedictine Society was concerning the overcrowded conditions at Saint Benedict School. 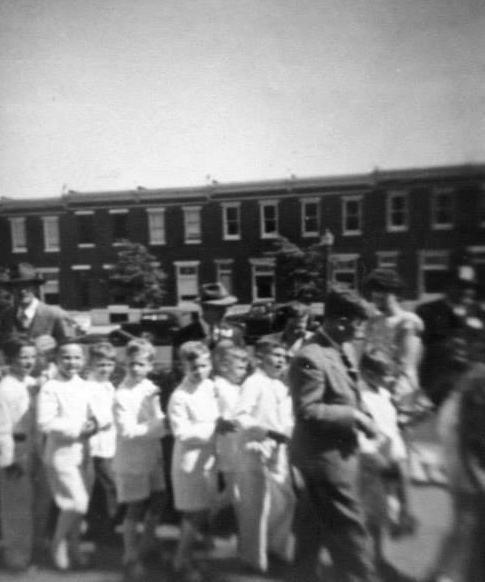 It was not until the mid 1950s that building began on a new school, with the dedication occurring in September 1955 by the Archbishop of Baltimore, Francis Keough. In the 1960s, news of the parent parish of Fourteen Holy Martyrs was not good. During a meeting of the Benedictine Society of Baltimore City on April 10, 1964, it was decided the parish would be dissolved by July of 1964, pending the approval of the Archabbot of Saint Vincent and the current Archbishop of Baltimore. The parish property sold. 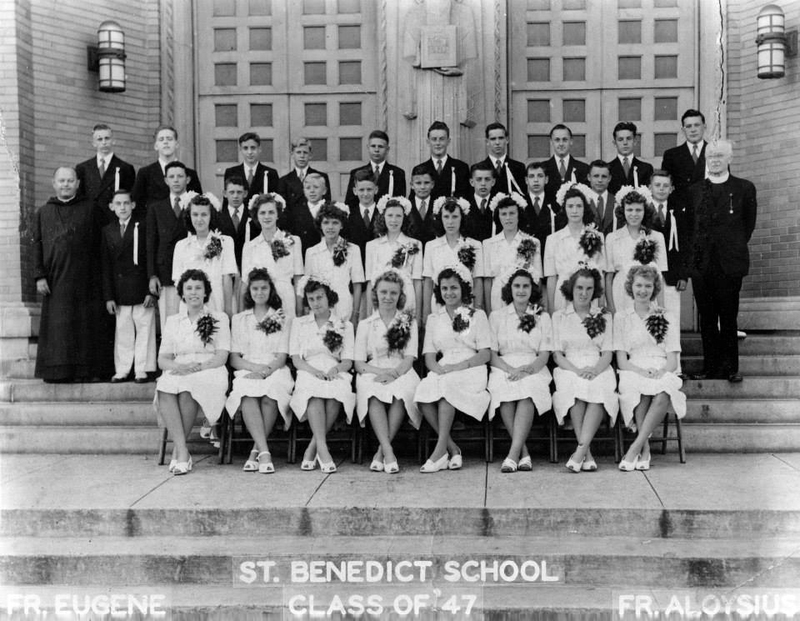 Despite some setbacks in revenue, Saint Benedict's spiritual and financial sense was growing stronger. Parishioners, renewed their dedication to a swift repayment of their parish's debt. The advent of the 1970s proved to be a precarious period in American history. The war in Vietnam was still raging, political figures were being assassinated, riots were ignited in many cities across the nation, civil rights upheaval and challenges to the traditional way of life, as well as the economy were factors that began buffeting the parish. Changes within Church life were becoming unsettling as well. Unprecedented changes in the liturgy of the Church brought with them changes in the attitude of Catholics toward their Church. Liberal-minded Catholics, clergy and lay alike, left the Church over disagreements with Church policies and doctrines. Steering the course through these times of trouble was not easy, as it seemed that all the parts of the parish were slowly coming apart. The School, once the pride of the Parish, was now becoming a financial drain. With loss of enrollment, and capital improvements needed, as well as the continual decline in the number of School Sisters to staff the school, its future was in question. The future of the school at Saint Benedict Parish topped the agenda for the Benedictine Society meeting in August 1973. The Society decided to reorganize the school so that it could participate in the Madonna Catholic Grade School of Southwest Baltimore, a cluster school organized to assist and coordinate educational efforts of many individual parishes. The current school building would now be known as “The Madonna Cluster School.” The cluster model became a success and brought with it “an innovative, quality education that has attracted the interest of many educators in the country,” reported the Benedictine Society. However the success of the Cluster School began to fade in the mid-1980s. The economy of the nation was faltering, and the steady decline in enrollment and financial drain on the parish revenues forced officials into a decision they had hoped to avoid. The cluster school, its students, teachers and possessions were moved to other facilities in the spring of 1988 and the building closed in June 1988. Even with this blow to the personality of the parish, in April of 1983 the Parish celebrated the Golden Year Anniversary of the Erection of the Church building. In July 1984 the Rt. Rev. Paschal A. Morlino, O.S.B., was assigned to the Parish of Saint Benedict. The first item on his agenda was a community census of Mill Hill. The census produced disheartening results: many local Catholics had lost their faith, while others simply lost their way to Saint Benedict preferring suburban parishes. A priority for Fr. Paschal was the resuscitation of the spiritual life of the Parish. He reintroduced the parish to the Liturgy of the Hours, in addition to daily Mass. The Eucharistic Liturgy would now be, prayed, sung and celebrated with the richness of tradition. This time marked the beginning of the parish's first group of Oblates. A Ministry of Music, coupled with counselors for local people and a revived Youth Outreach Program also began. The vacant school building continued to be a constant drain on the parish's finances. Many plans and programs had been reviewed for its future, but ultimately the building was in great need of updating and repairs—a task taken up by the parish's newly formed Alumni Group. Eventually all parish facilities were moved into the vacant school building. During the mid-1980s the parish commenced an extensive campaign to improve its facilities and infrastructure, beginning with the 50-year-old church building. This campaign included restoration of the stained glass windows, floor refinishing, paint to the interior, and the addition of ornamentation to the walls. A side chapel was also transformed into the Chapel of Our Lady. the addition of choir stalls made the chapel perfect for the Liturgy of the Hours. A new Altar of Sacrifice, formerly used in the Chapel of Seton High School, the creation of the Grotto of our Lady of Lourdes, and the resurrection and restoration of the 1913 pipe organ completed the campaign. A newly formed pastoral council was installed in 1991, and the Ladies of Charity again were on the move and growing with their acts of charity. The years of 1993 to the start of the New Millennium of 2000 AD were years of preparation for that event which would usher in the third Millennium of Christianity. Saint Benedict Parish was off to a good start. This spiritual journey began with weekly Exposition of the Blessed Sacrament and sung Vespers on Wednesday evenings. The parish property itself was enhanced that same year with the addition of the Grotto to Our Lady of the Streets. Additionally, memorials were added to this Grotto space that remembered the Unborn Children sacrificed by abortion, and deceased members of the Parish and the Clergy. The Grotto has become an outdoor focal point for many parish devotional activities and is a sign to the local community of the Love of God for all people. The early years of the New Millennium were quiet. Of note was the addition of the social agency Moveable Feast. This agency/outreach program prepares and delivers meals to homebound cancer patients and AIDS sufferers. The agency rented space from Saint Benedict Parish from 2003 to 2007 until a new location was found by that agency and their personnel and offices were relocated. In the ensuing years, though, the need arose to renovate the physical plant again and Fr. Paschal with his team of trusted associates began a process to acquire all buildings located near or surrounding the parish plant. With that in mind, they began the demolition of the crumbling structures to create a new facility under the direction of the parish that would make available apartments for low-income persons and become a parish activity center as well. The refurbishment of the school building was begun and the entrance to the school facility enlarged. Today, Saint Benedict is thriving and growing. with the addition of a gift shop, sacramentals are accessible to the faithful. With eucharistic processions, the faith is made accessible to the surrounding in a living, tangible way. The parish continues to live out the age-old Benedictine motto, Ut in Omnibus Glorificetur Deus!, that in all things God may be glorified.